Wimbledon is not just an English tourist destination...to us tennis players, it's THE destination of the Grand Slam event unlike any other...the event at the very top of our bucket lists...the experience of a lifetime. This year, The Championships at Wimbledon will take place from July 2 - July 15th, and for those lucky enough to attend, here are some great tips on tickets, prices, food, alcohol, fashion, and entertainment to help ensure you have the ultimate Wimbledon experience. If you're wondering how to get Wimbledon tickets, you're going to need two things: patience and a willingness to spend money. On the upside, it is one of the few major sporting events where there is an outside chance of getting a ticket at the last minute. Here's our grand plan for how to get Wimbledon tickets. My personal favorite: treat yourself to the wonderful Wimbledon hospitality you deserve. Hospitality packages are available through Keith Prowse, the officially licensed agent of the All England Lawn Tennis and Croquet Club (AELTC). Keith Prowse offers several incredible packages, all of which include great seating, a private dining venue with complimentary food and drinks, and on-grounds parking or other transportation options. 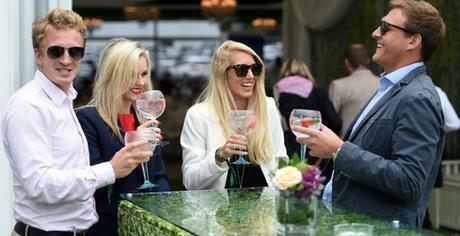 One of their packages is the fabulous "Player's Table" package where the seats are better, the food and drinks are much fancier, AND you get to mingle with a tennis celeb! You've finally made it to the Championships at Wimbledon, so do it up right! Purchase tickets online. Ticketmaster is the only legit online seller for Wimbledon tickets (not hospitality packages.) About 300 Centre Court and No 3 Court tickets are released to the site around 9am on the day before play. The tickets disappear insanely fast, so you'll need to glue yourself to your computer. There are also resale debenture seats which are offered on getmein.com (a branch of Ticketmaster) and www.wimbledondebentureholders.com. Prices vary depending on demand - Centre Court tickets in the later stages of the competition come at a hefty cost, but tickets for less sought-after seats can be snapped up for competitive prices. You can also purchase tickets from these sites: TicketLiquidator and StubHub. While not official sites for Wimbledon, they are still very reputable companies, with each having a long track record of making fans happy. Please note that tickets purchased online from these vendors are for seats only...all food, beverages, and transportation must be purchased separately. Enter the Queue. This option requires both time and patience, but the payoff could be big. 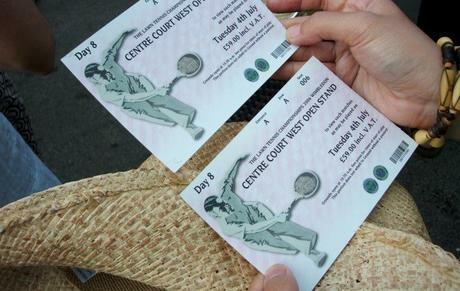 Around 500 premium tickets (one per person and cash only) are available daily for Centre Court, No. 1 Court and No. 2 Court, except for the last four days on Centre Court, when all are sold in advance. Many people camp overnight in tents at Wimbledon Park to get their place near the front of the queue, while others arrive in early that morning. There are also several thousand grounds passes available each day for £25 (about $35) to watch the action on the outside courts, where there is unreserved seating and standing room on Courts No.3-18. Also, the Queue is not without rules, which can be found HERE. Try the ballot. The Public Ballot, introduced in 1924, has always been substantially oversubscribed. Entry does not automatically entitle applicants to tickets for Wimbledon, but to a place in the draw for tickets (I know, right?!) It is not possible to request tickets for specific days or courts, as the day and court offered are chosen randomly by a computerized selection process. Be warned, this is not an online 'add to basket' situation, oh no. To apply, you need to fill in a public ballot application form on ACTUAL PHYSICAL PAPER, and send it along with a stamped, self-addressed (DL-sized) envelope to AELTC, PO BOX 98, London, SW19 5AE. Once it's received, they'll send you ANOTHER application form to fill out and send to AELTC, PO BOX 67611, London, SW19 9DT. If you're successful, you'll be able to pay for your ticket online using your debit or credit card. You can find the details of the application . The ballot for Wimbledon 2018 tickets ended in December 2017, but the 2019 run will be open again September 1st. How do I get to the tennis grounds? 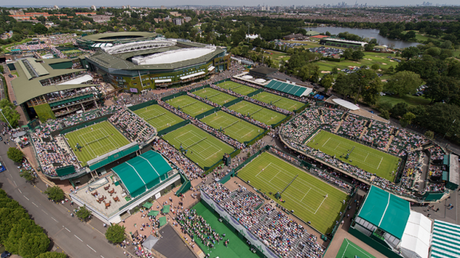 If this year is going to be your first time going, then there are a few things you will need to know when planning how to get to the Wimbledon grounds, as they are not close to the hotels or anywhere else in London, for that matter. Tube. Take the District Line Westbound to Wimbledon and get off at Southfields. Walk South along Wimbledon Park Rd and the event grounds are a 15-minute walk away. If you would prefer not to walk, you can catch the 493 bus from Southfields. You could also get off at Wimbledon Park or Wimbledon stations but the walk from either will be a bit longer at about 25 minutes. A bonus to stopping at Wimbledon station however you can board a London General shuttle bus service straight to the event grounds. Rail. The nearest railway station is Wimbledon station. If you're coming from central London, you can get a direct train from Waterloo. From Wimbledon station, you can get the 493 bus or there is the London General shuttle bus service which runs during the Championships. Bus. As previously mentioned the 493 bus is the best option but the 39 is a good alternative if needed. London General also runs direct shuttle bus services from London railway stations including St Pancras, Euston, Baker Street, Marble Arch and Victoria. Check the schedules on their website for full details. Tram. There are trams running to Wimbledon from East Croydon. Most of the time there's generally a tram every 10-15 minutes except for Sundays and early mornings and late evenings. Only the competitors have a strict dress code (an all-white kit); most spectators typically come in comfortable dress-casual wear (no tennis shoes or flip-flops), while those viewing matches at Centre Court and in hospitality areas are a little more formal (men wearing suits with ties, and the ladies in nice dresses). Just be sure to wear layers - temps start out in the 50's, with the highs in the mid 70's. What is the proper crowd etiquette? 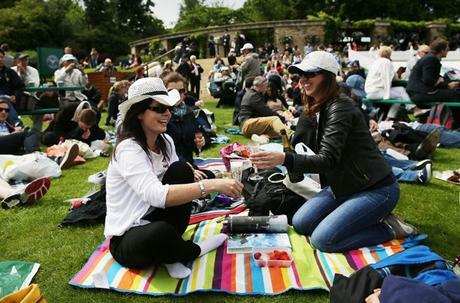 Swearing, booing and heckling frowned upon at Wimbledon (not that the players adhere to that.) It is acceptable however to 'ooh' and 'ahh' and of course, to cheer when the Hawk-Eye replay appears on the screen. You should also never applaud double faults or unforced errors, even if you hear others doing it. What do I if I catch a stray ball? The players only have 6 balls with which to play at a time, so the ball MUST be thrown back to a ball boy or girl, but never during play. If you'd like to have a ball as a souvenir, there are numerous reputable online sources like Amazon which have authentic Wimbledon player gear including unused court towels and balls, as well as authenticated autographed balls and other collectibles. In 2009 a retractable roof was installed on Centre Court, enabling play to continue during rain, but if you're watching on any other court, rain will always disturb play. Court 1 is expected to have its retractable roof finished by Wimbledon 2019. If you can't take shelter in You can take shelter in the museum and in the few merchandise shops, as well as the restaurants and cafés around the site. Other than that, the grounds are quite exposed, so be sure to check your weather app daily and take an umbrella. Can I take my own food to eat? Food on the grounds isn't cheap, so taking a picnic is a thrifty way to eat at the tournament...plus you'll avoid waiting for restaurant seating. Only one bag per person is permitted on the grounds and it must measure no more than 16″ x 12″ x 12″ (40cm x 30cm x 30cm.) No hard-sided picnic baskets or ice chests are allowed, so use a disposable bag that you can throw away once you've eaten your lunch. You're also allowed one bottle of wine or champagne (750ml) or two cans of beer (500ml) per person.